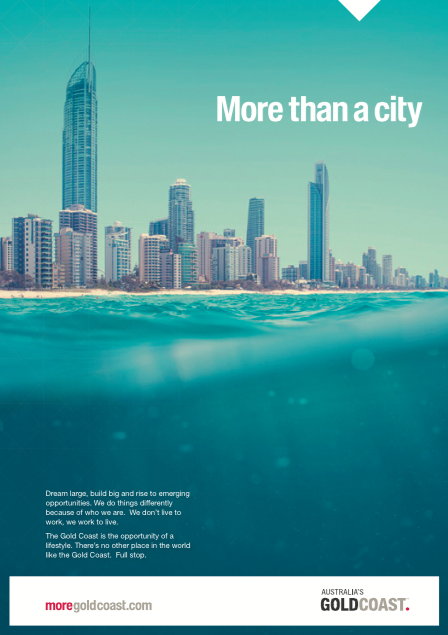 Blirt were appointed to develop reputation strategy in 2015 to set the foundations for a 10 year branding program of repositioning the City of Gold Coast. 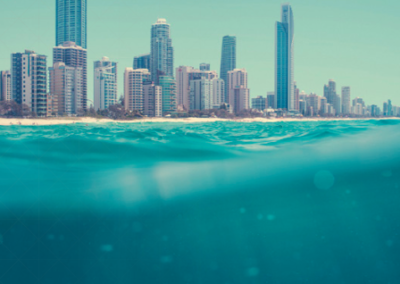 In November 2014 the City of Gold Coast were awarded the National Economic Development Marketing Award from Economic Development Australia for the City Reputation Project. 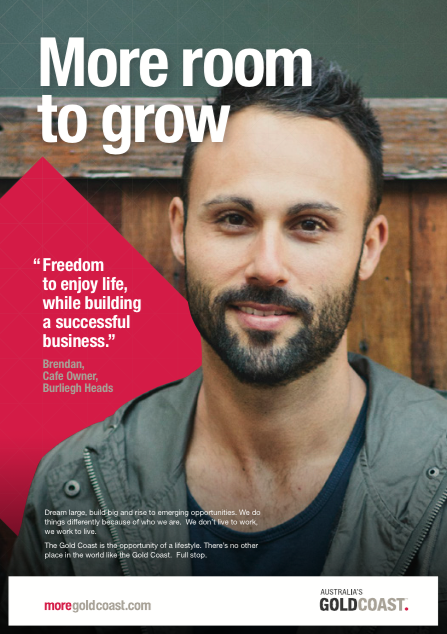 In 2013, Blirt was appointed by the City of Gold Coast Economic Development Directorate to produce a 10 year strategy for the roll-out of the recently released City brand identity, including a high-level over-arching strategy and more detailed short term (1-2 year) implementation strategy. 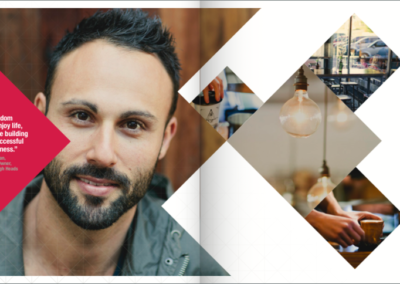 In late 2012 Gold Coast City Council released a new brand identity for the City & the Council administration. Blirt did not produce the brand mark released at that time but rather was appointed the following May (2013) to develop the brand & city reputation strategy. 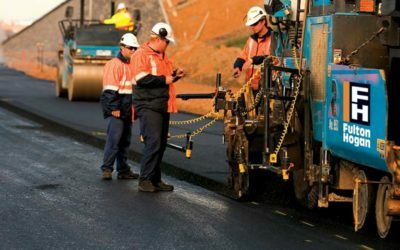 The City of Gold Coast was seeking clarity in how to change the negative perceptions of the city, build on the emerging opportunities from future major infrastructure and sporting projects and reinforce the positive perceptions already held about the City. 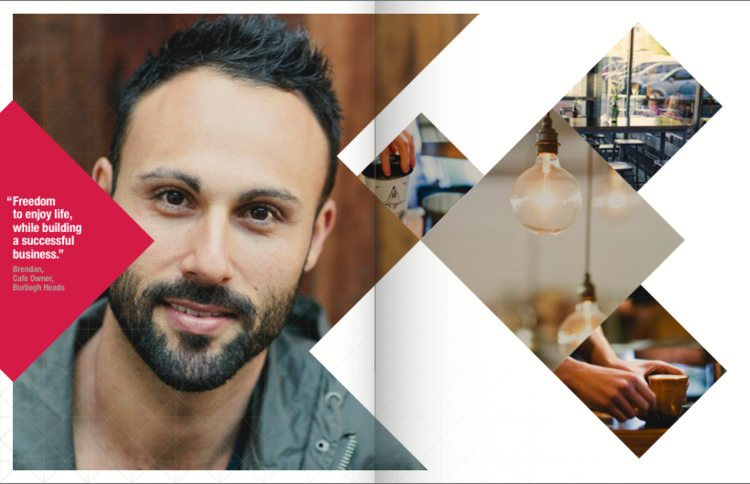 As an extension to our brand & reputation strategy work we were asked to enhance the recently released brand identity and build a creative platform from which to communicate the City’s rapidly growing benefits. To provide a clear framework for perception management and change in order to assist in unifying the city’s relevant stakeholders and communications partners. To translate the core brand proposition into a Creative Platform paying respect to the existing refreshed identity but evolving into a more focussed and clear message of competitive advantage. Purpose & Promise – what is the City’s underlying communication purpose & promise. 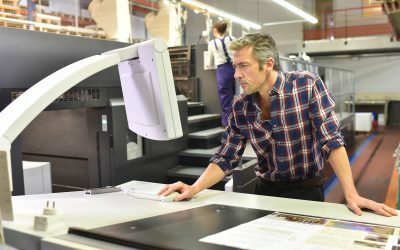 Positioning – what is the strategic positioning that brings the advantages to life through a creative communication platform. As a leadership & management guide we developed this into a Reputation Decision Wheel. The Reputation Decision wheel was designed to assist the various teams across Australia’s largest Local Government to effectively collaborate and deliver consistent outcomes. Then, we identified the gaps in the market & community of the ideal understanding of the City’s reputation and set about designing a services of strategic actions and tactics to begin changing mindsets with real stories. The report included a series reputation tracking recommendations which have been adopted to ensure the growth of the reputation translations into quantifiable actions and outcomes. We built a unified message framework from City Vision to City Plan to City Advantages to City Positioning. 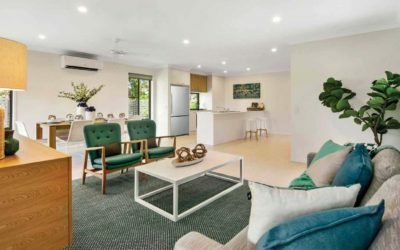 Why does the Gold Coast offer the opportunity of a lifestyle over any other city in Australia? Quite simply, because Gold Coast City is; more than a city. 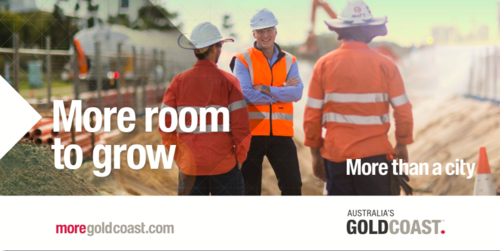 Competitively, this simply encourages others to investigate five better options before considering the Gold Coast. But, the Gold Coast isn’t like other cities. In fact, it’s nothing like other cities. Which is wonderful from a strategic differentaiton and story telling perspective. This is also why so many people love and misunderstand the Gold Coast. 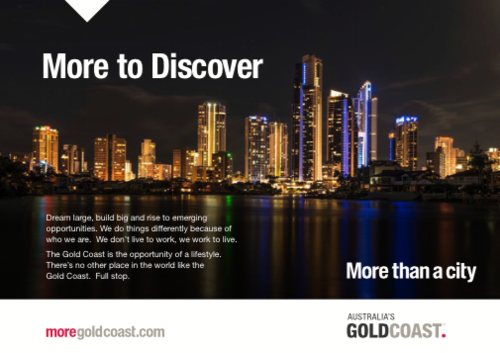 The Gold Coast’s competitive advantages come from all that surrounds our city. Quite simply, the reason why the Gold Coast presents such wonderful opportunities in business and lifestyle is because it’s more than a city. Our work extended into developing a creative platform which could be applied to the moregoldcoast.com.au digital execution and strategic positioning. Key visual identity linkages were the introduction of the “more than” symbol via a triangular device with the layering of the existing brand identity. 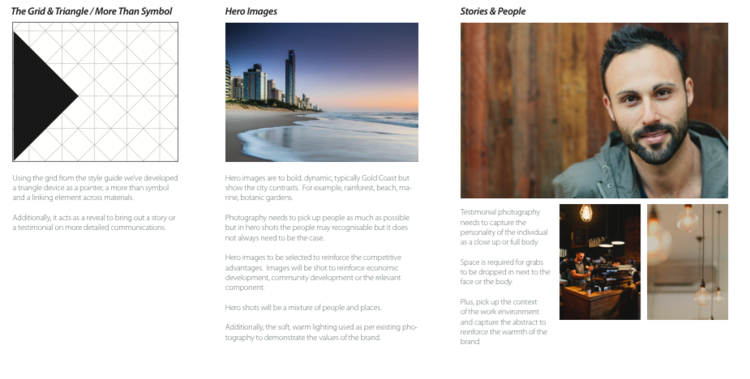 Leveraging this graphical device we were able to connect the key elements of the creative into a unified campaign platform; iconic Gold Coast images, strategic messages, more than statements. 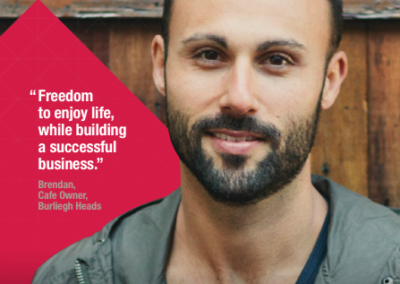 The foundations of the creative communications were the competitive advantages, the graphical devices, the iconic Gold Coast imagery and importantly, the ability to bring alive the stories of real people and real businesses across the city. The development of the business strategy was collaborative, creative and focussed on value creation. 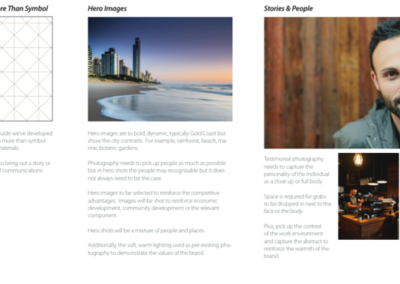 An award winning strategic and creative 10 Year Reputation Strategy with an accompanying refreshed creative platform approved by Gold Coast City Council. You can read an extract on the City of Gold Coast’s website here.